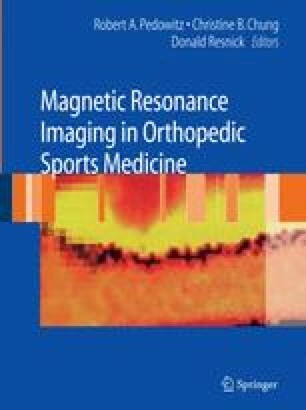 Over the past two decades, magnetic resonance imaging (MRI) has become the imaging modality of choice for evaluating most soft tissue and osseous abnormalities in the ankle. The technique offers a noninvasive and expeditious diagnostic assessment of ankle injuries, which are often occult on conventional radiographs and computed tomography (CT). This chapter provides a brief review of the normal magnetic resonance (MR) anatomy and a detailed discussion of abnormalities around the ankle including tendons, ligaments, nerves, fascia, and bone. Routine MR images are obtained in the axial, coronal, and sagittal planes (Fig. 11.1). We obtain the axial sequence immediately after a three-plane positioning scout. The coronal and sagittal planes are prescribed obliquely using the information acquired on the axial images. Thus, the coronal images are obtained parallel to the anterior margin of the talar dome, and the sagittal images parallel to the lateral wall of the calcaneus. Imaging the ankle is often performed with the patient supine and the ankle in neutral position.1 The ankle in neutral position has an inherent 10 to 20 degrees of plantar flexion2 and 10 to 30 degrees of external rotation. This mild degree of plantar flexion is useful for eliminating magic angle effect when examining the flexor and extensor tendons in the hindfoot and midfoot. 1 Increasing the fat planes between the peroneus brevis and peroneus longus tendons, and displacing the flexor and peroneal tendons away from the bones are other advantages of imaging the ankle in plantar flexion.3 Mechanical stabilization of the ankle is paramount for good image quality. 4 Immobilization can be achieved using foam sponges between the ankle and the coil and Velcro straps on the leg outside the coil. We utilize an imaging protocol that combines T1-weighted and fast spin echo T2-weighted images as well as fluid-sensitive T2-weighted sequences with fat saturation.